Why is Robert Mugabe visiting the Vatican? On May 1, Pope John Paul II was beatified. The second-to-last step in the road to sainthood, beatification occurs when the Catholic Church declares that a deceased person has intervened on behalf of someone who worships in his or her name. (In this case, a French nun recovered from Parkinson’s disease after having prayed to the former pope.) Nearly 90 delegations from around the world, including 16 heads of state and representatives from five royal families, traveled to Rome to attend the event. Among the invited guests, sitting in the front row, no less, was Robert Mugabe, president-for-life of Zimbabwe, responsible for the deaths of untold thousands. In response to queries about the propriety of inviting the dictator to such a solemn event, a Vatican spokesman simply said, “Zimbabwe is a state with which the Holy See has diplomatic relations. There is therefore nothing to hide.” How could the Vatican be content to host such an ignominious figure? Despite his Marxist pretensions and passionate rhetoric against the West, Robert Mugabe has long been an admirer of the Catholic Church. Born at a Catholic mission station in British-ruled Southern Rhodesia, he attended Jesuit schools. The Jesuits instilled a love of learning in Mugabe, who went on to earn seven degrees during the 14 years he spent in prison for anti-regime activities. Perhaps as a result, the Vatican has tended to give Mugabe a free pass. This month wasn’t the first time Mugabe had come to the Vatican: In 2005, he attended the Pope’s funeral. (On both occasions, he was able to get around a European Union travel ban—which has been in effect against him since 2002—and enter the Vatican under the terms of the Lateran Treaty, the 1929 accord recognizing the Holy See as a sovereign state. The agreement established a “diplomatic corridor” between the Vatican and the rest of the world, thus allowing someone like Mugabe to travel over Italian territory.) The Vatican’s indulgence of Mugabe has extended to more quotidian affairs as well: It offered a Papal blessing to his 1996 marriage to Grace, his second wife, despite his having fathered children with her out of wedlock while he was still married to his first wife, Sally, who died of kidney failure in 1992. The Church’s stance is all the more odd because Mugabe has been at war with local Catholic bishops in Zimbabwe for some time. The conflict’s roots lie in Mugabe’s campaign against the Ndebele ethnic group, which he waged during the 1980s with a brigade of North Korean-trained soldiers. The campaign ultimately took the lives of 20,000 people. A Catholic priest in Harare subsequently accused the regime of following a “genocidal course” against the Ndebele. In 1997, the Catholic Commission for Justice and Peace in Zimbabwe—an arm of the of Zimbabwe Catholic Bishops Conference—published a groundbreaking report about the massacres. Over the past ten years, as the country has careened from the trauma unleashed by the land reforms that evicted white farmers from their property, to famine and cholera outbreaks, to election-related violence, the local Catholic clergy has released a steady stream of statements criticizing the regime. When it comes to Mugabe, the Vatican has its defenders. 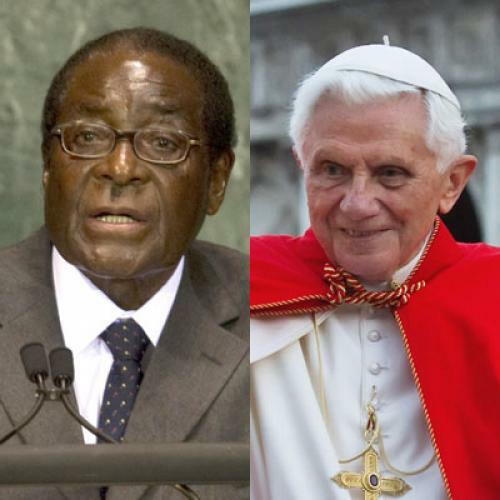 “It is perfectly true [the Vatican] could place Mugabe under interdict for his many sins and misdemeanors, but if you start with Mugabe, where would you finish?” Alexander Lucie-Smith, a British Catholic priest, wrote in the Catholic Herald. “Should Berlusconi also be banned? What about the much married Sarkozy?” But the comparison is clearly specious. Berlusconi and Sarkozy, whatever their foibles, are both democratically elected leaders accountable to their people; neither has engaged in the wanton torture, mass murder, and electoral skullduggery that have marked the three decades of Mugabe rule. “Only God who appointed me will remove me,” Mugabe said in 2008, as he stole yet another election. “Even Romans 13 says leaders are appointed by God. I am an image of God, who appointed me to my current position.” Clearly, the Vatican’s power to bring about change in Zimbabwe is limited. But given the role that religion obviously plays in Mugabe’s self-image, it would be nice if the Church stopped treating him like a legitimate head of state. James Kirchick, who has reported from Zimbabwe, is a contributing editor for The New Republic and writer at large with Radio Free Europe/Radio Liberty based in Prague.